“Chance Encounters” explores the delicate play of accident, mistake, and meaningful coincidence as part of the process of making work and in the experience of interacting with it. 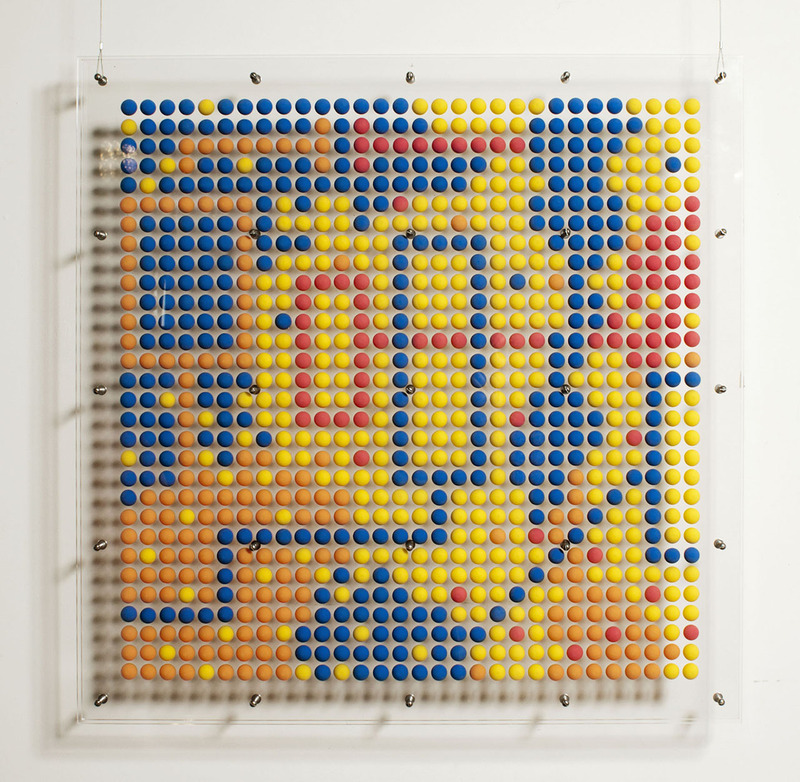 Many of the sculptures feature organic dispersions of balls that suggest essential forms viewed through a microscope or telescope — universes of particles, organisms, energy fields, thoughts or spiritual impulses. 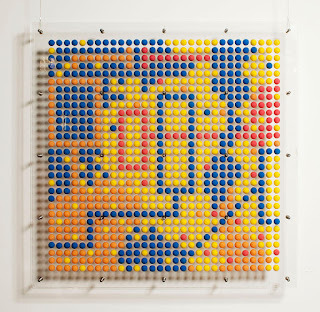 These contrast with pieces in which 100’s of bouncy balls are arranged into perfect grids, conjuring a pixellated reality reminiscent of 8-bit computer graphics from the 80’s and 90’s (particularly early video games like Asteroids, Space Invaders, Super Mario Bros., etc. ), used here to evoke a range of abstract topographies. Lastly, quarter vending machines normally used to dispense gumballs and stickers are repurposed into participatory art pieces. Mutsu Crispin is the art alias of John DiGeorge, who spent his childhood outside of Atlanta playing in streams, collecting Legos, watching cartoons, drawing monsters and triumphing at video games. He studied visual art and filmmaking at Harvard, and was an assistant instructor for classes in oneiric cinema (films dealing with dreams and other altered states of consciousness). After working on a variety of film and art-projects in Boston and NYC, he moved to southern Vermont and began producing his first independent feature film, Redbelly, now in the last stages of postproduction. He has exhibited paintings and sculpture, created art installations, worked as a welder, performed as a dancer and clown, and run a small design company. He is represented by Mitchell Giddings Gallery and was recently commissioned to create a series of large sculptures for the newly constructed headquarters of Exelon Corp. in Baltimore, MD.